I'm linking up with Sally from Elementary Matters in her "Let's Have Some Fun!" linky party. As we're all working hard to get ready for the new school year, let's remember to not get too caught up in the rush, and include a little (or a lot!) of fun in the classroom. Here's how our linky works: first I'll share a FUNNY "school" story, and then I'll share a FUN product of mine. Let's do it. So I was walking my students to lunch, single file line and all. I notice Jimmy chatting it up with a buddy. From the front of the line I wave him down and give him the Can-we-please-just-get-to-lunch-before-we-begin-our-very-loud-conversations? look. You know the one. Squinty eyebrows. Clenched jaw. I thought he caught my drift, but wouldn’t you know it, a little further down the hall ol’ Jimmy had found someone else to chat it up with. I waited until we reached the cafeteria and let all the other students pass. When Jimmy walked by, I tugged him out of line, so we could have our own little chat right there in the hallway. Now Jimmy has a good heart. He looked surprised, dumbfounded, clueless. And scared. “Let’s talk, Jim.” And just as the tears began welling up, I knelt down on one knee and put my hand on his shoulder. I thought I might get through to him a little better if I was on his level. What he did next surprised me. Jimmy proceeded to also get down on one knee and put his hand on my shoulder as well. There we were, a two-person huddle in the middle of the hallway, looking like we were having a pre-lunch prayer. He looked up at me and started shaking his head at himself, while patting me on the shoulder. “I’m sorry, Mr. Friermood. I’m real sorry,” he says before I even begin. Oh, Jimmy. What a funny memory! 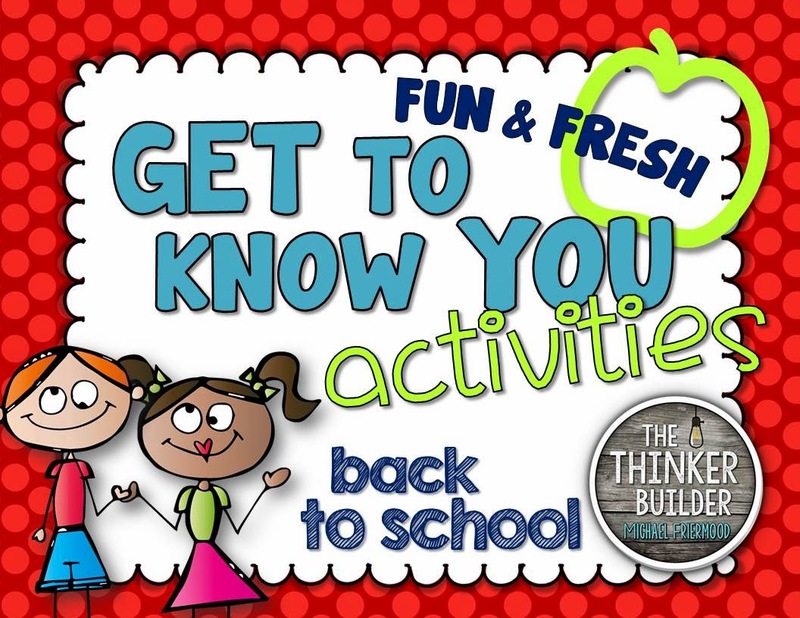 My fun product I thought I'd share is my "BACK TO SCHOOL 'Get to Know You' Activities: Fun & Fresh!" 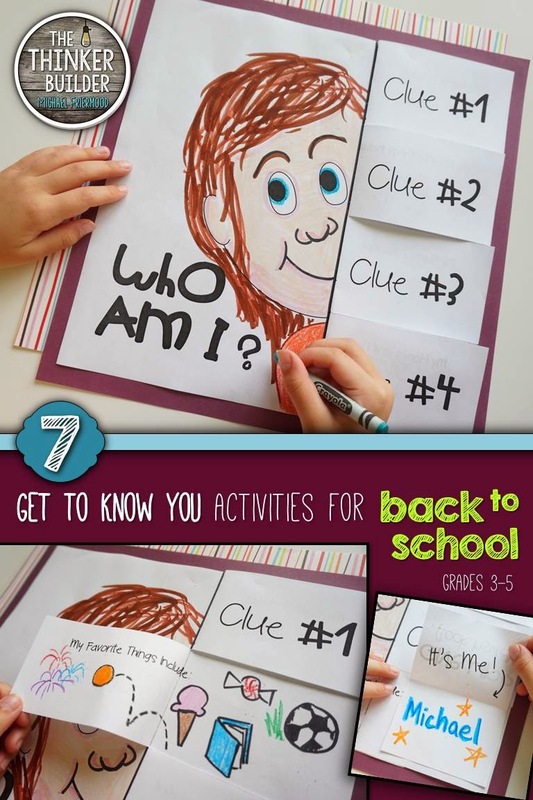 There are seven activities in the pack, and are designed for grades 3 through 5. A couple of my favorite activities within the pack are the "Who Am I?" 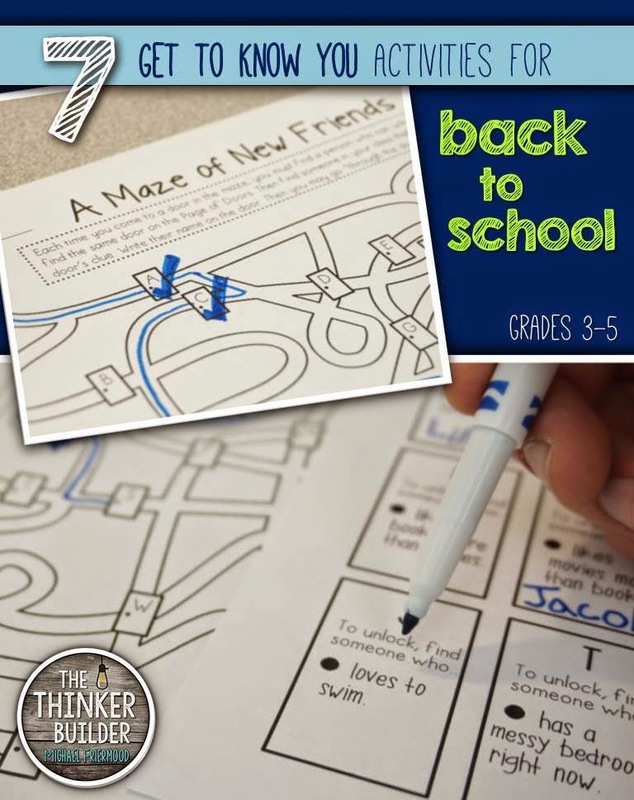 poster with open-the-flap clues about the student, and "A Maze of New Friends" where students must "unlock" the doors in a maze by finding classmates who fit the clues. Feel free to check it out! 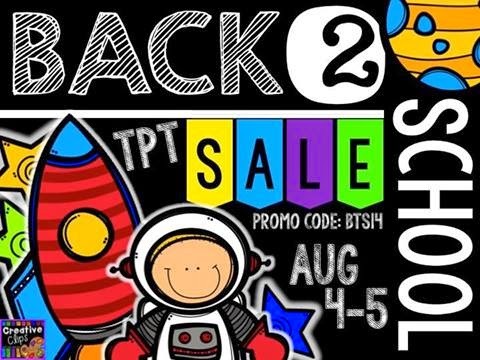 You can save 28% on this and ALL my products during the HUGE Teachers Pay Teachers Back-to-School Sale on August 4th and 5th. Just used promo code BTS14 for the extra discount.